The Vending Miser is always happy to be back in Chicago to have an opportunity to work with old neighbors. Benjamin School District in West Chicago jumped on board to reap savings by installing Vending Misers that will save them an average 46% on their electricity consumption. Now, on to really important stuff like, which famous Chicago pizza sounds good for tonight? 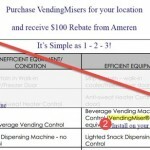 Ameren offers $100 Rebate for VendingMiser NEVER plug in a Beverage Machine!